Paula Crossfield and Naomi Starkman created food blog Civil Eats, recruiting voices from around the country to write about the power of good food. Paula Crossfield and Naomi Starkman met in 2008 when Alice Waters brought them together to work on Slow Food Nation in San Francisco. The pair created a blog, recruiting voices from around the country to write about the power of good food. The site garnered more than a million visitors. In January 2009 they decided to keep it going under a new name, Civil Eats. For the next five years they published the prize-winning blog without pay—neither for themselves, nor their 300-plus contributors. To compensate writers and hire a managing editor, they turned to Kickstarter in fall 2013 to raise $100,000. “Everybody thought we were crazy,” Starkman says. “It got worse when it was hovering at $30,000 two weeks in,” Crossfield adds. But by the final hour, more than 1,100 backers pushed them $892 past their goal, the most money raised by crowdfunding to date by any daily news site. 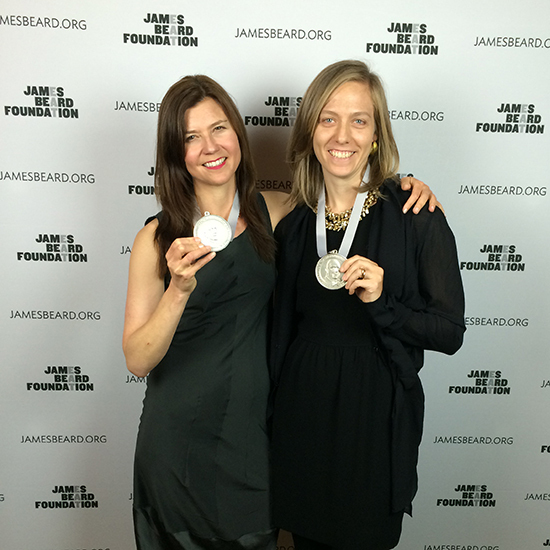 This year, they were awarded the James Beard award for publication of the year. Here they share how they did it. NS: People didn’t know we were essentially a no-profit entity. They thought we were this big media company. The fact that we had so may people writing to us for free, for so long, that was kind of stunning for folks to realize. Our proof of concept was there. PC: It helps explain how we got 1,100 supporters. A lot of them were the who’s who of the food world, like Ruth Reichl, Michael Pollan, Mark Bittman, Marion Nestle. PC: They were tweeting it every couple of days. NS: José Andrés offered to cook a dinner for six in his home, and to give away dinners in his restaurant. I’d never really met him, but he was one of our biggest champions. NS: Michael Pollan very graciously agreed to be in our video. But he doesn’t appear until the end. Our analytics showed that the average person who donated only watched the first 30 seconds. We had this notion that Pollan was selling it for us—which he did, enormously—but not in the video! PC: If you’re going to have somebody endorse you, that person should be right up front. NS: You have to have good giveaways. I wish it weren’t that way, but that’s our culture. Any donor to NPR, they want something for what they give. PC: It was great how many experiences we ended up having to offer. We started out with maybe three, and they went quickly. So we reached out for more. PC: …which got us 75,000 hits in two days. The tipping point. NS: Then we reached a critical moment. They tell you if you don’t get to one-third of your take by a specific point, you don’t make it. We were in New York and panicking about it. A dear friend, Lowell Sheldon of Peter Lowell’s in Sebastopol, California, made a significant donation that changed the game. Crowdfunding is not for the faint of heart. You have to be willing to call on every resource you’ve ever touched. PC: And do it shamelessly because you believe in what you are doing. NS: We have to figure out, is Civil Eats a nonprofit? A subscription-based model? Do we go after traditional advertising? We had to think like editors for so long, now we can think like publishers. PC: Our aspirational budget is $500,000. We’d like to hire a reporter to cover food policy in DC, for example. Right now we’ve raised $100,000 from Kickstarter, an additional $50,000 from one funder and $10,000 from another funder. We have another series of funders that we’re talking to now. NS: We’d like to develop a membership program down the road. And we’d like to amplify visual storytelling.